Creating a mind map of your dream can be a great way to interpret its meaning. In this post we'll explain what a mind map is, and how you can use it to better understand the meaning of your dreams. A mind map is a diagram used to represent words, ideas, tasks, or other items linked to and arranged around a central keyword or idea. In dream interpretation, a mind map is a diagram that displays words and ideas about the dream and the dream symbols. A mind map can be as simple or complex as you want it to be. You can use mind mapping software, or you can draw it on a piece of paper. It can be done with one pen, or you can make it very colorful. Mind maps can be a great creative outlet for interpreting your dreams! 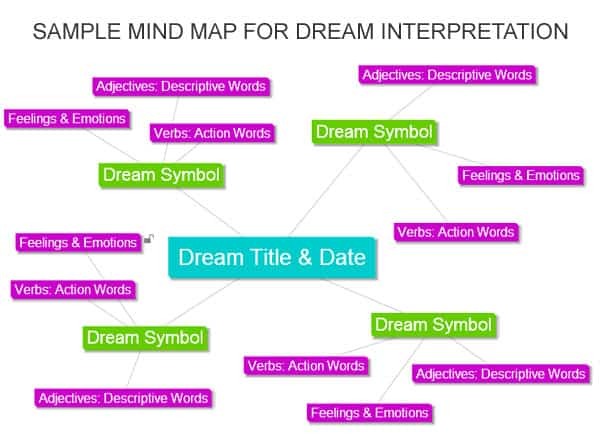 Here are a few examples of dream interpretation mind maps to help you understand how they are used and how they can help you understand the meaning of your dreams. This example below shows how you can write down the symbols in the dream, and then write about descriptive words, feelings and emotions that have personal meaning to you in the dream. It is a very simple and basic way to interpret the meaning of a dream, as well as understand what different dream symbols mean to you. 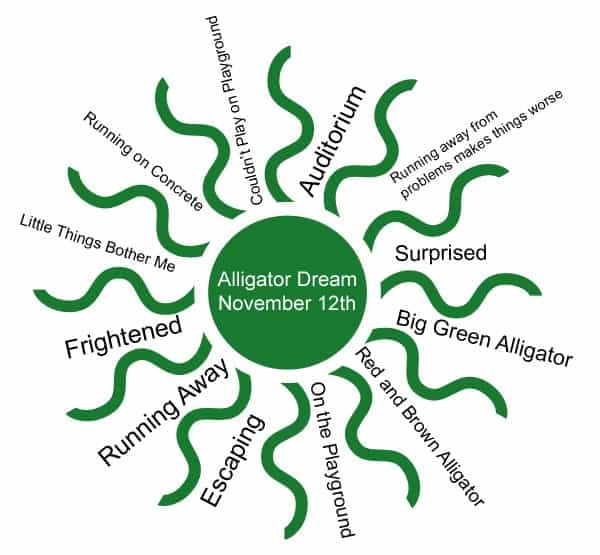 In this example, the dreamer had a dream about a small alligator on a playground. She ran away. On her way to safety (a nearby auditorium), she encountered a much larger alligator. This mind map shows some of the thoughts, feelings, actions, and descriptive words that came to mind when describing the dream. In this instance, the dreamer is able to see some common themes that related to her everyday life - spending too much time in a stressful work environment where everything is bothering her - not enough playfulness and creative expression. Understanding this dream helped her see that finding a way to reduce stress at work and make more time for the activities she enjoyed would help her find a better balance in her current life. Making a mind map to interpret your dreams doesn't have to be difficult. Here are some tips to help you in the process. Keep it Simple: Your mind map doesn't have to be elaborate or fancy. The simpler it is, the easier it will be to interpret. Start in the center with the main title/topic of the dream, and then branch out from there using descriptive words and phrases and thoughts that come to mind when you think of the dream. Use Software If Need Be: Not good at drawing or organizing your thoughts on your own? Do you have messy illegible handwriting? There are a number of free mind mapping software tools you can use to make a mind map easily. Write Down Every Thought or Idea That Comes to You: Making a mind map is an exercise that will help open your mind. Do not judge or criticize the ideas that come to mind - write them down! They may provide a lot of insight into what the dream means when you are done. Use Images & Drawings: Adding illustrations, symbols, or drawings can help you to better understand your mind map then just using words. So feel free to doodle, sketch, or draw while making your mind map. Use Association: When you think of one word, what other words do you think of? Using association to add more and more to your mind map will help give you further insight into the meaning of the dream. For example, if you think of alligators, what else do you think of? Swamps, scaly skin, crocodiles, etc.- all examples of association. Have you used mind mapping as a technique to interpret your dreams? What do you enjoy about mind mapping? Share your thoughts in the comments section below. My dreams involve loved ones that have passed and are very vivid, but really crazy. They’re all mixed up and go from one situation to another. When I wake up I’m usually scared and confused. They are scaring me.